This article is the second article in this series. The first, “Why Process Sounds Stupid” was published by BPM Institute in May, 2011. Data – There is limited data gathering at this point. Advantages- A clear statement from executives is a powerful beginning. Training to large numbers of employees begins to build common understanding and nomenclature. A full list of key processes and their documentation gives a comprehensive perspective. Challenges – This process can take a long time with very little business result. Often there are many activities but not much return from actually analyzing and improving processes. 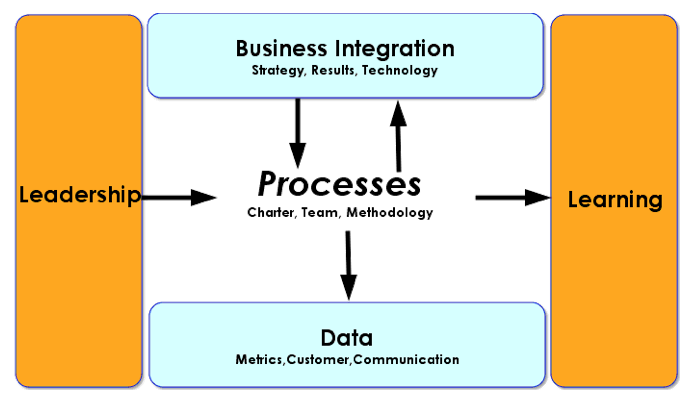 Although processes have process owners, their role and their authority are unclear. Typically process owners are not leading any improvement efforts. Training provides concepts and tools, but these are not yet applied to real work. Sometimes managers and employees just get tired of doing this work and not seeing any change. Data – The manager “knows” what the problem is so will probably not feel the need to collect baseline measures or get customer feedback. After a process is improved the team promotes their results, but again they have limited quantitative data to show the level of change. Advantages – The bottoms-up effort just needs a single manager, a process and a team to get started, so start up effort is minimal. Efforts can be quite focused—on specific defects, at a customer touch point, or a full process. Business improvements start happening in the work place. Employees and leaders are learning and applying principles and tools to real work examples. Challenges – Smaller improvements may be contained and not widespread. There is no enterprise strategy for a process focus, so the initial improvement efforts do not have a big impact on the corporation as a whole. This effort can spread virally, but if may also die with just a few early adopter groups. Leaders may not have the ability and resources to influence and implement projects outside their departments. Leadership: Executives or managers in specific divisions or functions select the processes to work on based on real needs in their divisions, choose team members, and provide the time and budget to do the work. These executives or managers are active sponsors for the process improvement efforts they select. This is similar to leadership in the bottoms-up effort but at a higher level in the organization. 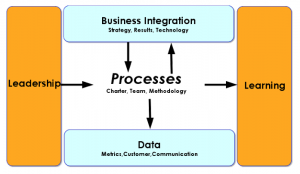 Business Integration: The executive or division leader identifies key improvement goals for the processes, in alignment with their strategy and company goals. Learning: The executive or manager hires a consultant to assist him/her and the teams. Unlike the bottoms-up approach the leader is unlikely to do all the work himself. The company’s learning and development department can also provide just-in-time training to teams as they have projects. Team members learn process skills while doing the work and often see the process from end-to-end for the first time. Advantages – The biggest advantage of this approach is that real work is being done to improve processes that are important to the executive sponsors, and secondarily to the enterprise. With processes of wider span the opportunity for larger results is much greater than in bottoms-up. Employees and managers are learning from doing, as with bottoms-up. Implementation is successful because all involved want to make it happen. Challenges – The processes that division leaders select are important to them but they may not be the highest priority for the organization. In fact improvements in one area might have a negative impact on another area. In other words, the organization is not looking at its processes fully from end to end. But it has taken good initial steps. The question really is – where are you now, and how do you move up the maturity level? More importantly, would moving up a step on the maturity scale result in improved performance or profitability? John Alden (who developed another process maturity for the Object Management Group) says that moving up the maturity scale does not guarantee an increase in business performance, but these elements are inter-dependent. Find some appropriate early adopters –probably division leaders and process subject matter experts for middle-out improvement projects or supervisors and their employees for bottoms-up projects. Define success for those projects – from a business and capability perspective – so you can measure your work against the organization’s goals, improvement targets and metrics. bottoms-up approach in one retail store, selecting a process that was key to sales and customer satisfaction. They mapped the current process and talked with potential customers to understand their need. Then they developed a new process with specific resources targeted at this customer segment. Success spread to other retail stores because of the business results, employee empowerment, and viral communication. One biopharmaceutical company had a process MOW and was at process maturity level 2. Department managers had the flexibility and autonomy to run their departments as they saw fit. Their executives were strong advocates of a process approach and provided the general direction but did not get directly involved. Because of the cultural elements, they began with choosing less complex processes at departmental level, getting success, and then going to divisional or cross divisional processes. A utility company had strong involvement between employees. 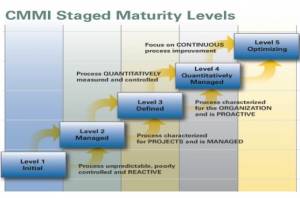 They were at level 2 process maturity for the organization and level 3 for some individual processes. They used a top-down approach initially, defining and modeling core process for the enterprise, choosing process owners and executive sponsors over multiple process owners, and a BPM support center of experts. They struggled with how long it took to model As Is processes. They began to make progress when they focused on processes for one early adopter executive sponsor and used a middle-out approach with that person as a leader. The combination of top down and middle out was more successful.